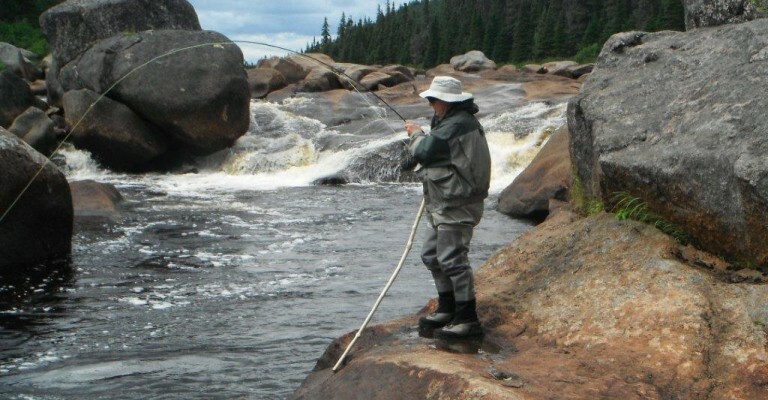 Booking time on great salmon rivers like Hawke River is often a matter of being patient and persistent. Our booking policy is quite simple, and awards our long-standing customers for their loyalty. Once you’ve had a chance to visit with us, you will be given the first option to book the same week for the following year. In order to reserve your spot, we will require a $500 deposit before leaving the Lodge and, on or before October 15th, we will require that your deposit be topped up to 50 percent of the future year’s trip. If you change your mind come October 15th, we will return your deposit if and when we are able to sell your space. If you up your deposit to 50 percent and then fail to pay the balance before our final payment date, the same policy will adhere. If we are able to sell the space, we will return your deposit. However, should the space not be sold, your deposit will be forfeited. If you are a first time customer, we will require a 50 percent deposit at the time of booking. Complete, sign and return the Credit Card Authorization Form. Please be advised that there will be a 2% service fee on all credit card charges. Given that a large percentage of our customers will be repeat customers, we suggest that you pay close attention to our Available Dates Chart. This section of our site will be updated on a very regular basis and should reflect what is available. Once a calendar week has passed during the season, we will update the site and you will be able to see whether spots are available for the following year. Similarly, pay close attention to October 16th. Given that October 15th is the 50 percent deposit date, we will update the site on the 16th and you will be able to see if any additional spots are available. We would also suggest that you stay in contact with us, as we will keep a waiting list that will be emailed should spots become available. Prime Fishing Dates Available for 2019!